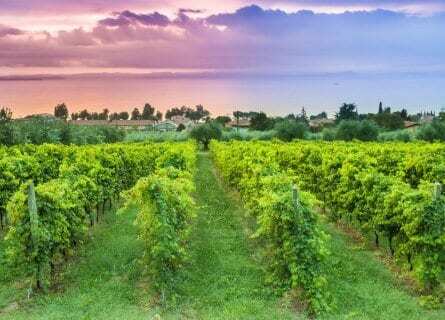 This luxurious private Lake Garda Wine Tour in Northern Italy is designed for food and wine lovers looking for a relaxing and uplifting few days in the magnificent Italian Lakes. Your base for this gourmet break will be beautiful Lake Garda, the southernmost Italian Alpine lake, known for its charming lakeside hamlets, picturesque ports, and wines (Lake Garda is home to many wine appellations from Bardolino to Lugana). Spend the tour tasting wines, enjoying a special private cooking class in a boutique ristorante with stunning views, and try some delicious olive oils. Sleep in a luxurious villa dating back to the 1800s, which rests majestically on the water and is enclosed in lush parkland. Lake Garda is full of darling villages such as Malcesine, Gargnano, Gardone, Salò, to Sirmione with its fairy tale castle. On your first day, you will venture into Italian bubbly territory, Franciacorta, and enjoy a wonderful private visit to a premium estate. Carry on to your historic villa hotel, with endless local legends and stories (read on below!). Over the next few days, you will visit the lake by private boat, meet local chefs and winemakers and hopefully, thoroughly relax. 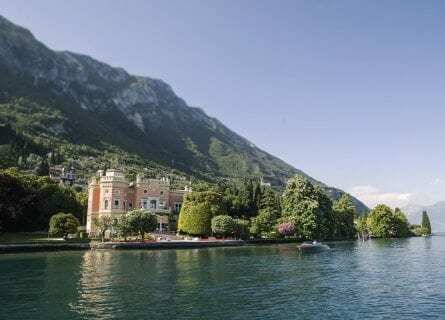 If you want a luxurious and soothing vacation full of dramatic lake and mountain scenery and unforgettable Italian food and wine, then contact us for more information on this itinerary. This morning you will arrive in Venice or Milan airport (AM). Your own private chauffeur will be waiting for you and you will step into your luxurious Mercedes and head for the Franciacorta wine hills. Franciacorta is the most high end and famous region in Italy for bubbly, and you will visit a fabulous small boutique estate making not only different types of bubbles from brut to “Saten”. The sparkling wines of Franciacorta are made with Chardonnay, Pinot Bianco, and Pinot Nero, and are elegant and creamy bubbles. Taste wines in a private corner of the estate, perhaps overlooking the vines. Lunch is in a brick vaulted trattoria in wine country, one of our favorites, known for its superb local cooking. Specialties could include Risotto al Franciacorta in cialda di Grana (risotto slow cooked in Franciacorta wine). After a lingering lovely lunch, complete with excellent local grappas to wash the meal down, head to Lake Garda to your villa hotel. This is a hotel with many local legends and anecdotes. It was originally an eccentric businessman’s mansion, and acted as a hideaway in later years for Mussolini! It has been a luxury hotel for the last decade, and you can expect a historic property with all the creature comforts. The setting is just gorgeous. Enjoy a free night tonight to get settled in. Wake up in a spectacular setting, with views of the lake, the lemon grove, and a massive magnolia tree. After a wonderful breakfast, you will head to Torri del Banco by your own private boat. Upon arrival, you will taxi for the last five minutes up the hill to the venue for your charming and private cooking class. Andrea and Lara are your delicious hosts, and you will start the day with an invigorating cappuccino and brioche. Your chef will present the menu for the day and you will get ready to be a sous-chef for the day. Sharpen your knives! Learn the basics of ciabatta, focaccia pasta, risotto, antipasti and more. After your cooking lesson, sit down to the fruit of your labors, right in the elegant dining room, taking in the sumptuous views. 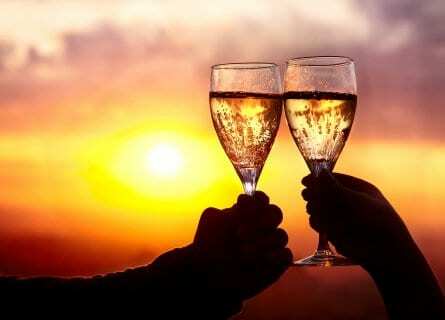 You will taste various wines that are carefully selected to pair with your dishes. Enjoy! After this convivial morning and lunch, hit the lake for a private cruise. From the comfort of your own boat, take in the views such as the Scaligero castle, the villa that once belonged to Maria Callas, the Grotta di Catullo caves, the pretty Isola del Garda, Baia delle Sirene, and more. Stop for a late afternoon aperitif in the Taverna San Vigilio with its million dollar views. Free evening tonight. This morning, enjoy a late start! Take time to enjoy your surroundings, perhaps take in a morning walk along the Caribbean clear lakeside, or just get some extra sleep. Around 10:30 AM, your chauffeured Mercedes will arrive to take you to the Valtenesi in the pretty green hills between Desenzano and Salò, on the western side of Lake Garda. You will visit and have a tasting at a top winery such as Cascina La Pertica, an organic and biodynamic gem. Their wine Garda Cabernet Le Zalte 2003 received the Tre Bicchiere award (“Three Glasses”, the highest honor in Italy). Enjoy a private tour of the estate followed by a VIP tasting of course! Before you leave, your hosts will give you a small gift. Lunch will be in a traditional and characteristic high-quality trattoria where your meal will be carefully planned with paired wines. After lunch, your next port of call is a traditional “Frantoio” (an olive oil producer). Learn about Italian Olive Oil, traditional methods of production, and finish your visit with a fantastic tasting of olive oils. You will visit Salò next for some free time to relax at a wine bar, go gourmet shopping, or just soak up the atmosphere. On the way back to the hotel, if you are a history buff we recommend a visit to the Villa Vittoriale. Once the private estate of Italian poet and military adventurer, Gabriele D’Annunzio, this villa is in the art books for its Italian Art Deco interior. Free evening. Today you will depart. We recommend you take a late flight so you can enjoy a stop in Bergamo, one of our favorite little-known art cities. Drop off at your preferred time at the airport. Airport transfer at your desired time. This concludes your gourmet tour in Lake Garda.